← How to Make Easy Chocolate Covered Strawberries: A Book Club Treat! If you read our blog with any degree of frequency, you may have gathered a few things about me: I prefer paperbacks to e-books and classics to the weekly best sellers. I also have a culinary habit that I just can’t seem to shake. I never follow recipes. Like ever. Sometimes I’m convinced I can improve on what an expert chef has masterfully created. A dash of cinnamon is almost always involved. Other times, my alterations are an attempt at making a perfectly fine dish “healthier”: less sugar, no butter, whole wheat flour. True, on occasion, this yields some epic fails. Most recently, I “tweaked” an oatmeal, cinnamon, chocolate cookie recipe by substituting applesauce for butter. The results hung around our home for weeks; it now lives in infamy as “that cookie.” However, despite these fiascos, I’ve also stumbled upon some pretty tasty and healthy dishes. Maybe you don’t feel any impulse to alter your recipes. Perhaps you’ve never tried to make a brownie without chocolate…so none of this relates to you. Right? Wrong. Why do I try to make recipes “healthier”? Simple. Because I want something that only seems like a guilty pleasure. I want to indulge without feeling bad. It’s the same reason I wait until J.Crew puts their cashmere on sale, my kids only watch “educational” television, and it’s the same reason I read YA by authors like Hillary Frank. On the surface, Frank’s young adult novel, The View from the Top appears typical of the genre: it centers on Anabelle’s last summer home before heading off to college. Sounds cute, right? But not so fast. The characters struggle to come to grips with their changing lives; friendships and romances are forged, broken, and tested. Frank utilizes a shifting point of view, alternating between six characters. Most impressively, she manages to give surprising depth to each of them. The tone is witty, quirky, and realistic. I found myself eager to slow the novel’s quick pace to allow myself more time to think. The View from the Top gave me something I wasn’t expecting: a bit of literature disguised as a beach read. An indulgence the intellectual in me could feel awesome about. 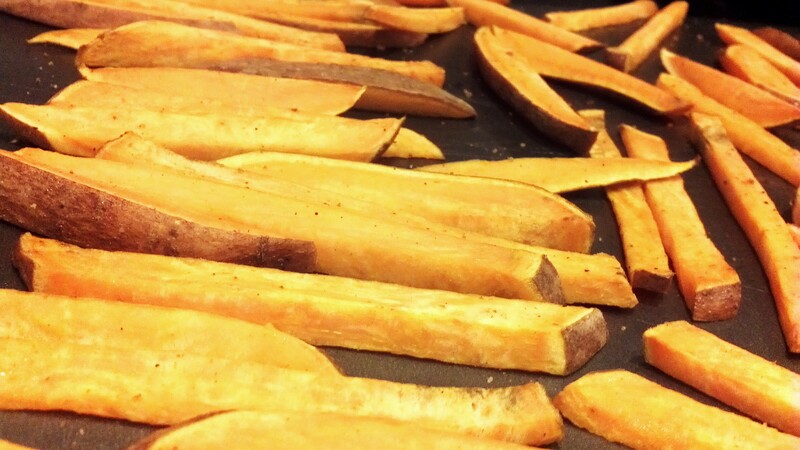 My sweet potato fries are another splurge that will leave you feeling totally guilt free. We eat them at least once a week. They are baked in the oven, but taste every bit as good as if they were deep fried. Cut raw sweet potatoes into a French fry or cube shape. Place the pieces on a single layer on a cookie sheet, and brush both sides with a very light coating of olive oil. Sprinkle with salt and pepper. Bake for 20 minutes at 400 degrees. Flip the fries and cook for an additional 20 minutes. This entry was posted in Books, Easy preparation, Healthy alternatives, Side dishes, the view from the top, Vegetarian and tagged baked sweet potato fries, book reviews, books, cooking, food, health food, healthy side dishes, how to make sweet potato fries, Recipes, side dishes, sweet potato fries, sweet potatos, young adult books. Bookmark the permalink.